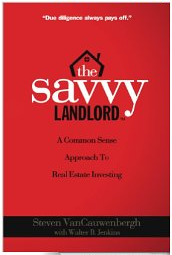 The Savvy Landlord is a simple yet powerful guide to creating freedom through rental property. If you need motivation to build wealth, this inspiring true story about one man's journey from being homeless to owning a multi-million dollar real estate portfolio is for you (This resource also makes a great gift). The author, Steven VanCauwenbergh, has purchased 50 income producing properties. His book covers a multitude of real life issues, including how to find and buy income producing properties, how to deal with residents, and how to manage your real estate empire. * Recommended Rental Forms landlords should be using! 1) The complete book audio set, unabridged, approximately 6 full hours. 2) Bonus Audio CD Material, with additional tips from the author along with questions and answers. website visitors as an introductory offer only $55, save $20 off regular price.